Today is the day before ECB’s big decision day . As of now, ECB is set to inject up to 1.1 trillion euros in to the economy to fight deflation. We will know the exact details tomorrow. But the day’s economic news were still significant. Early in the day in Far-East, Bank Of Japan maintained its current stance and did not add to the stimulus plan. This strengthened the yen as it disappointed dove as BoJ will only continue with its plan to increase the monetary base at an annual pace of 80 trillion yen ($679 billion). BoJ also cut its inflation projection to 1 percent for the fiscal year starting in April and raising GDP target to 2.1 percent. Here is the 240-minute chart of yen. 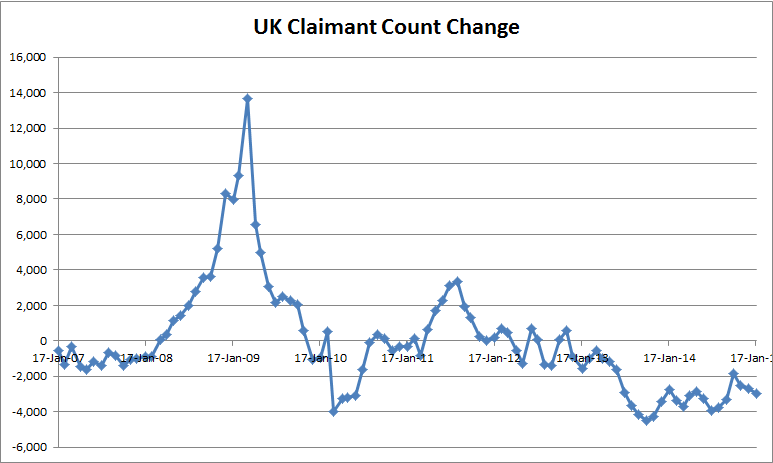 UK’s Claimant Count better than forecast. 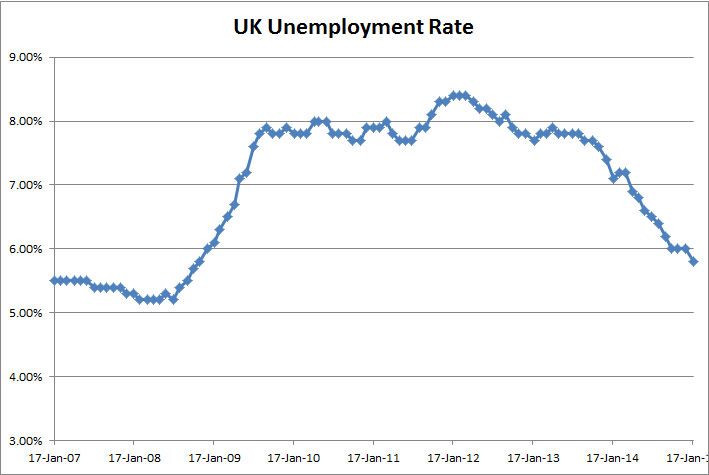 This is the change in the number of people claiming unemployment related benefits. The actual was -29.7K and the forecast was -24.2K and last month’s reading was -26.9K. Lower number (or negative) means that fewer people are claiming unemployment benefits. 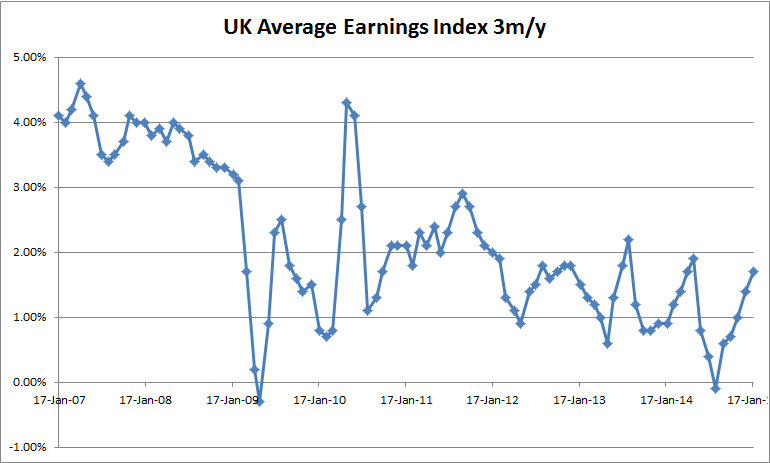 UK’s Unemployment Rate improved to 5.8% from 6.0% and 5.9% forecast; and the Average Earnings Index 3m/y came in line at 1.7% and previous reading of 1.4%. The climb in salaries is accompanied by a fall in cost of living. Bank of England also came out with MPC Official Bank Rate Votes and the threat of deflation is real as the hawks have dropped the demand for rate hikes. Same with MPC Asset Purchase Facility Votes, in which the BOE is holding on to status quo. The day’s another firework came from the Bank Of Canada. 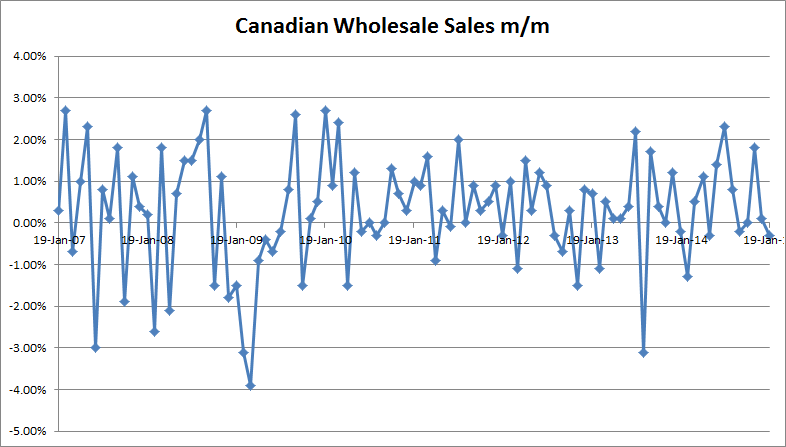 Canadian Wholesale Sales m/m disappointed at -0.3% versus the estimate of0.2% and last month’s reading of +0.1%. 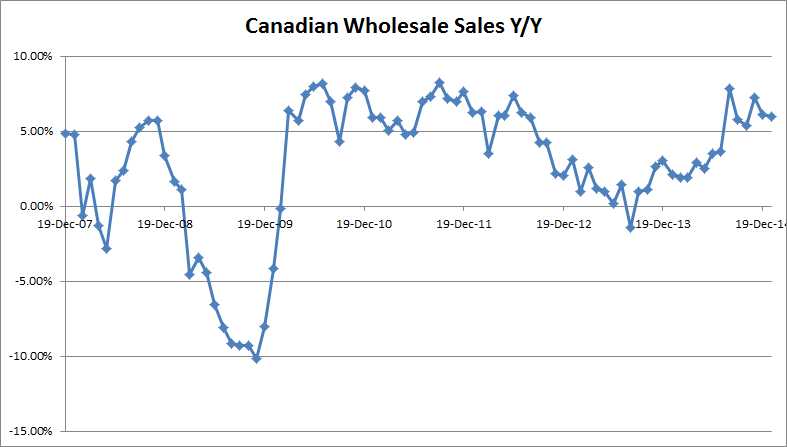 The BoC also, unexpectedly, cut the overnight interest rate by 25 basis points to 0.75%. The stated reason is that the falling crude-oil prices are “unambiguously negative” for its economy. The central bank also lowered GDP forecast for 2015 to 2.1% from 2.4% and said that it expects the headline CPI to fall to 0.3% for Q2 from 0.5% in current quarter. BoC’s overnight interest rate was steady since September 2010. The overall action for Canadian dollar was negative. It shot up versus the greenback. Here are the charts. There were some mixed news from the housing sector in the U.S.A. 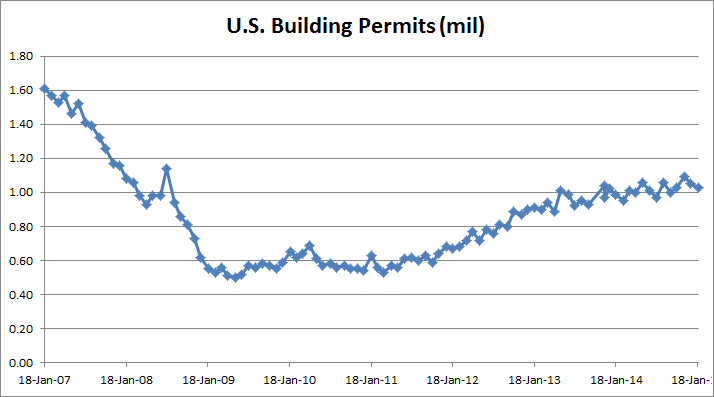 The Building Permits came at 1.03M, which is below the forecast of 1.06M and previous months reading of 1.05M. 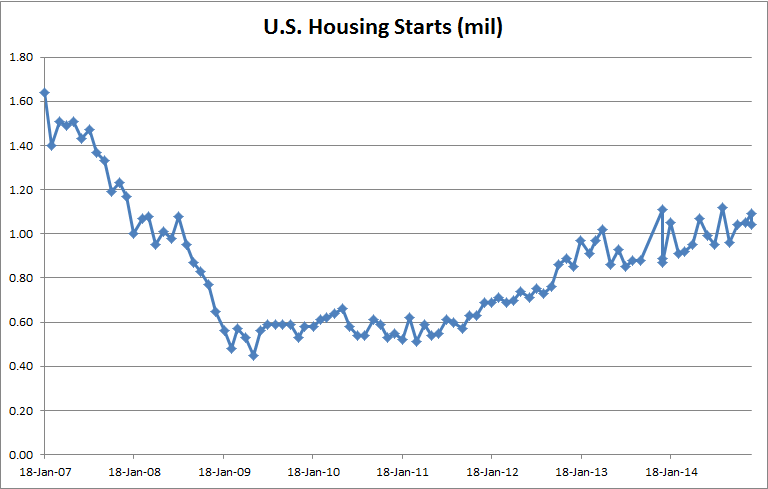 But, the Housing Starts was better at 1.09M versus 1.04M of estimate and 1.04M of last month. January 21, 2015 in Market Diary.